Before I post my next family member I MUST tell you about new info I have found. So yesterday I posted about my Great Great Grandmother Martha Brooks. If you didn’t read it she was owned by Whitfield Brooks and was given to his son Preston Brooks by him. It also stated that she was a breeder so she had more children than we know about. A couple could have been by one of them. Well….I want to take you back to high school. The picture you see above is a picture of a southern congressman beating a northern congressman. We learned about the man being beat. His name was Charles Sumner the abolitionist who fought against slavery along with Lincoln. He was beaten because of a speech he gave on the Senate floor on May 20, 1856. This speech was to put it lightly downing Senator Andrew Butler (D-SC) and Senator Douglas (D-IL). Well two days later a young man also a senator from SC approached Senator Sumner letting him know that he didn’t like what was said about his state nor his fellow colleague and uncle. Yes Butler was also a relative of this young man. 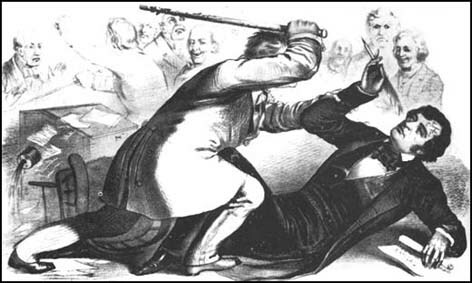 The young man proceeded to strike Senator Sumner several times over the head with his cane. Hitting so much and so hard that the can broke. That young man was Preston Brooks the man who owned my GG grandmother. This is an amazing story to me because you just never know who you are related to. Is there proof we are related not yet but we all know that black women were constantly raped and had children by their masters and I believe if he didn’t his father or brother did at least once. How would they know she is a breeder. But I am not mad I can’t be. It is past and instead of being mad you learn about it, you learn from it. My family has that fighting spirit as Preston Brooks. My family comes from a long line of successful men and it seems every generation that I have found so far black or white there was a politician. 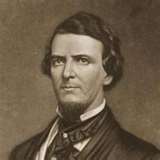 Preston Brooks is one of the main causes of the Civil War or as southerners called it the War Between the States. Ironicly because of his stupidity and arrogance something that he almost killed a man over, something that he believed so passionately in (slavery) was eventually ended. Thank you Mr. Brooks, Cousin Brooks, Uncle Brooks or Grandaddy Brooks whatever you are to me for doing what you did.